The update is for the Wi-Fi versions of the devices and finally brings Samsung's tablets current with Jelly Bean, after the company slowly rolled out Android 4.1 to its phones in the fall. Android 4.2 has already begun appearing on some Nexus tablets. The more intriguing features, however, come from the Samsung Premium Suite, with special attention to the capabilities of the stylus. 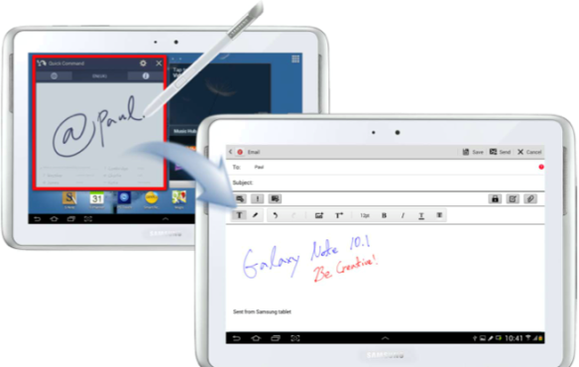 The Galaxy Note 10.1 was the first in the company's line to support a multiwindows feature so you can run two apps side by side on screen. The feature later trickled through to the Note smartphones and Galaxy S III phone. Now, Samsung has updated this feature for the Note 10.1 with a cascade view, which lets you freely resize, move, and pin selected apps in multiple views, running simultaneously. Air View is another interesting feature provided in this update; it adds functions to use of a stylus. For example, you can hover the stylus across the scrubbing bar to preview thumbnails of the video section and then jump to a video. With the camera app, you can hover the stylus over an album to preview all the photos inside. 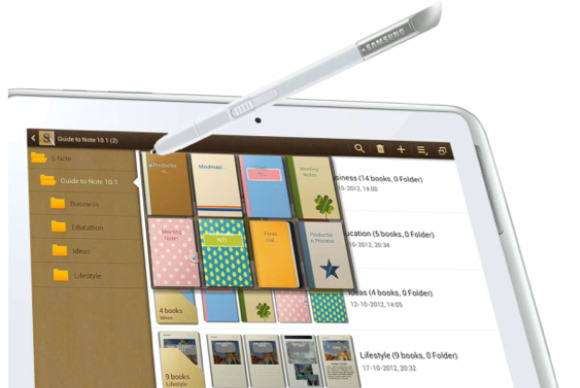 With Samsung's Air View, hovering the S Pen over folders and notes produces a pop-up preview. Air View also works with email. You can hover the stylus over an attachment icon to preview a mail message. With the web browser, holding the S Pen stylus over the edge of the screen will automatically scroll your content. Other Premium Suite updates to the Galaxy Note 10.1 also have to do with the S Pen. A new Quick Command feature lets you open apps that are used most often by writing command shortcuts using either custom or preset stylus strokes. You can can write directly on your emails, send a handwritten note, or sign every email with your signature. Also, you can now record your sketching in the S Note app and play it back stroke by stroke. The Android 4.2 Jelly Bean updates for the Galaxy Note 10.1 and Galaxy Tab 2 are available over the air or through Samsung’s Kies software, connected to your PC via a USB cable.